OurEnergyPolicy.org | Post-Event: What Will EPA’s Ozone Rule Mean for the Energy Sector? On September 16th, 2015, OurEnergyPolicy.org (OEP) hosted a panel event moderated by Mark Drajem of Bloomberg News on EPA, ozone and the energy sector at the National Press Club in Washington, DC. EPA is expected to announce a new standard for ground level ozone, a smog-forming pollutant. Most believe they will reduce the existing standard from 75 parts per billion (ppb) to 65 or 70 ppb by 2025. According to EPA, this would prevent 4,200 premature deaths, between 1,400 and 4,300 asthma-related emergency room visits, and between 320,000 and 960,000 annual asthma attacks in children. The very spirited discussion largely hit at the cost of compliance. Under the Clean Air Act, EPA is obligated to ensure the ozone standard adequately protects public health and welfare and while EPA estimates that moving to 65 ppb could cost around $15 billion per year, the National Association of Manufacturers (NAM) believes the cost of 65 ppb to be closer to $140 billion per year. EPA will likely establish the new standard in October; however, discussion over its impact on the energy sector will continue. Below is a video of the discussion and questions posed to the panelists. You can also find a transcript here. 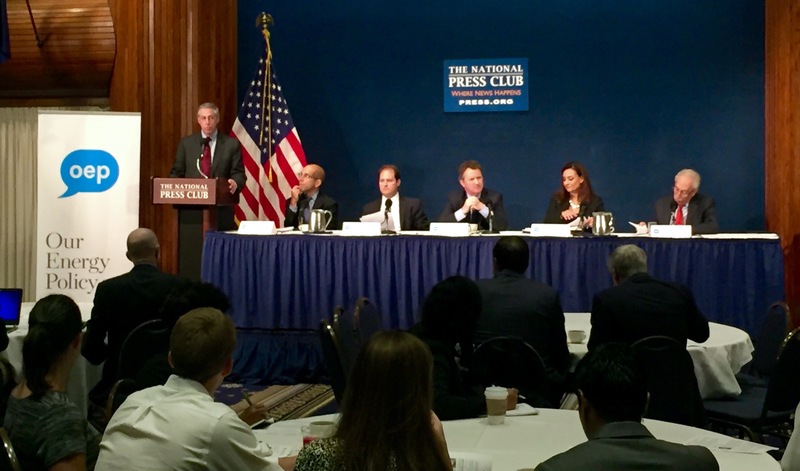 2 Responses to Post-Event: What Will EPA’s Ozone Rule Mean for the Energy Sector? A great discussion … Reading through the transcript it became very clear to me that getting to really strong reductions is a complicated matrix of possibilities that actually should make the outcome easier not harder. Use of the word ‘unknown’ by the EPA was confusing. Instead of fighting the rules I would hope there are enough out there who will lay out broad plans to meet the end results and just head there. The climate discussion has turned a corner, I think. Of interest is the bill introduced yesterday by Senators Hatch and McCaskill, which allows local communities to engage in voluntary cooperative agreements with EPA to develop tailored solutions that can make it easier for them to comply with the NAAQS. These agreements, referred to as Early Action Compacts (EAC) were originally initiated, successfully (13 of 14 localities were able to avoid a non-compliance designation), by EPA in 2002 but later halted after a lawsuit where the court ruled that EPA was outside of its Clean Air Act statutory authority. I’m curious, what do others think about this program and its ability to alleviate some of the concerns about the ability of counties to meet the standard?